Carprieve (Carprofen) is a Rimadyl generic that provides clinically effective pain relief associated with osteoarthritis and post operative pain associated with soft tissue and orthopedic surgeries in dogs. It is non-narcotic, non-steroidal, anti-inflammatory and is available as scored caplets that contain 25 mg, 75 mg and 100 mg per caplet. Always provide Client Information Sheet with prescription. Carefully consider treatment options before deciding to use Carprieve. Use the lowest effective dose for the shortest duration consistent with individual response. The recommended dosage for oral administration to dogs is 2 mg/lb of body weight daily. The total daily dose may be administered as 2 mg/lb of body weight once daily or divided and administered as 1 mg/lb twice daily. For the control of postoperative pain, administer approximately 2 hours before the procedure. Carprieve chewable tablets are scored, and dosage should be calculated in half-tablet increments. Tablets can be halved by placing the tablet on a hard surface and pressing down on both sides of the score. These liver-flavored Carprieve chewable tablets may be offered to the dog by hand or placed on food. If the dog does not willingly consume the tablets, they may be hand-administered (pilled) as with other oral tablet medications. Care should be taken to ensure that the dog consumes the complete dose. View Carprieve Drug Facts Sheet. INDICATIONS: Carprieve is indicated for the relief of pain and inflammation associated with osteoarthritis and for the control of postoperative pain associated with soft tissue and orthopedic surgeries in dogs. CONTRAINDICATIONS: Carprieve should not be used in dogs exhibiting previous hypersensitivity to carprofen. WARNINGS: Keep out of reach of children. Not for human use. Consult a physician in cases of accidental ingestion by humans. For use in dogs only. Do not use in cats. All dogs should undergo a thorough history and physical examination before initiation of NSAID therapy. Appropriate laboratory tests to establish hematological and serum biochemical baseline data before, and periodically during, administration of any NSAID should be considered. Owners should be advised to observe for signs of potential drug toxicity (see Information for Dog Owners, Adverse Reactions, Animal Safety, and Post-Approval Experience). What is Carprieve Caplets? 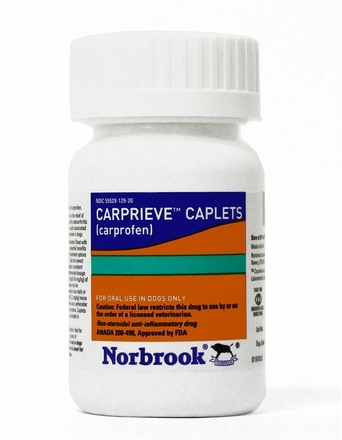 Carprieve Caplets is a nonsteroidal anti-inflammatory drug (NSAID) that is used to reduce pain and inflammation (soreness)due to osteoarthritis and pain following surgery in dogs. 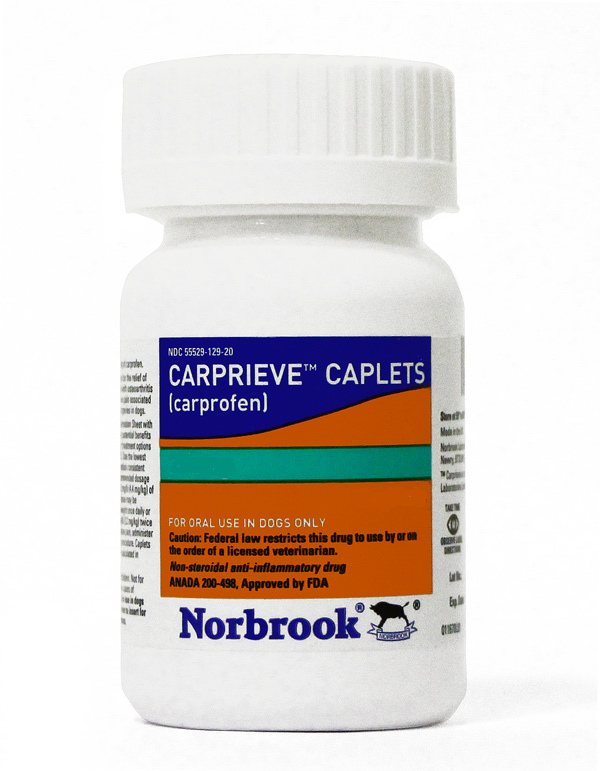 Carprieve Caplets is a prescription drug for dogs. It is available as a caplet and is given to dogs by mouth. To control surgical pain (e.g., for surgeries such as spays, ear procedures or orthopedic repairs) your veterinarian may administer Carprieve Caplets before the procedure and recommend that your dog treated for several days after going home. What kind of results can I expect when my dog is on Carprieve Caplets? While Carprieve Caplets is not a cure for osteoarthritis, it can relieve the pain and inflammation of OA and improve your dog's mobility. If Carprieve Caplets is discontinued or not given as directed, your dog's pain and inflammation may come back. Has had an allergic reaction to carprofen, the active ingredient of Carprieve Caplets. Carprieve Caplets should be given to dogs only. Cats should not be given Carprieve Caplets. Call your veterinarian immediately if your cat receives Carprieve Caplets. People should not take Carprieve Caplets. Keep Carprieve Caplets and all medicines out of reach of children. Call your physician immediately if you accidentally take Carprieve Caplets. How to give Carprieve Caplets to your dog. Carprieve Caplets should be given according to your veterinarian's instructions. Your veterinarian will tell you what amount of Carprieve Caplets is right for your dog and for how long it should be given. Carprieve Caplets should be given by mouth and may be given with or without food. What to tell/ask your veterinarian before giving Carprieve Caplets. What tests might be done before Carprieve Caplets is prescribed. What are the possible side effects that may occur in my dog during Carprieve Caplets therapy? Carprieve Caplets, like other drugs, may cause some side effects. Serious but rare side effects have been reported in dogs taking NSAIDs, including Carprieve Caplets. Serious side effects can occur with or without warning and in rare situations result in death. It is important to stop therapy and contact your veterinarian immediately if you think your dog has a medical problem or side effect from Carprieve Caplets therapy. If you have an additional question about possible side effects, talk to your veterinarian. Can Carprieve Caplets be given with other medicines? Carprieve Caplets should not be given with other NSAIDs (for example aspirin, deracoxib, etodolac, firocoxib, meloxicam, tepoxalin) or steroids (for example cortisone, dexamethasone, prednisone, triamcinolone). Tell your veterinarian about all medicines you have given your dog in the past, and any medicines that you are planning to give Carprieve Caplets. This should include other medicines that you can get without a prescription. Your veterinarian may want to check that all of your dog's medicines can be given together. What do I do in case my dog eats more than the prescribed amount of Carprieve Caplets? Contact your veterinarian immediately if your dog eats more than the prescribed amount of Carprieve Caplets.